Are you on the app or the website? If you're on the website, I would suggest for every noun class you make a list of possessives. This is what I've copied from the notes. I've also grouped the ones that are shared between different noun classes. It's not perfect, and I'll likely tinker with it as my understanding grows, it its a start point. Obviously, just replace -angu with -ako or -ake or whichever you're interested in at the time. Thank you so much - I'm still very confused by all the noun classes, but once I get my head around them, I think this will be super helpful! The above is missing a few things. It won't help you with subject prefixes for inanimate nouns (anything not human or animal), because they don't appear to be covered in the tips and notes (unless I missed it). You might have to go googling noun classes for that info. Animate nouns which, regardless of their noun class, behave like M/Wa grammatically, and use the a- and wa- prefixes. Their noun class denotes their pluralisation behaviour only. So for the most part we should be able to do these easily using this course tree. 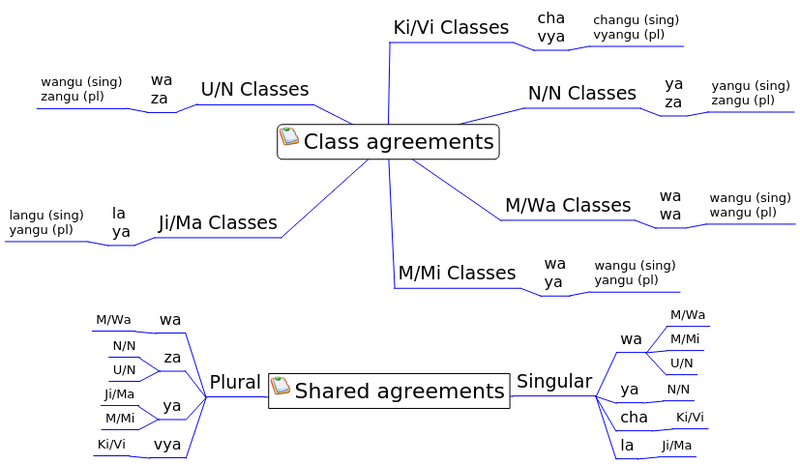 I think mind mapping software is a good idea for this course's grammar, because once you mine the available information it gives you a lot more freedom to arrange it in ways that make sense to you.